Are you an educator who teaches game development, art, music, programming or design? Interested in course or curriculum development? Game-based learning? Working on research in the field? Is your company developing products for the space? Are you just plain curious about games and education? Faculty, teachers, professionals and researchers from college to high school to kindergarten to industry are welcome to drop by, meet colleagues, share ideas, make new friends and network. Please click here to register. In addition to the meet-up, attendees will have a chance to visit the MassDiGi Summer Innovation Program featuring student developed projects. 18 students from 9 different colleges and universities are participating in SIP. For more information on the program, please visit the SIP pages on the website. Light snacks and refershments will be available. Please join us from 2:00-4:00 p.m. on August 6th for an open house featuring the projects from the MassDiGI Summer Innovation Program. Students (18 from 9 different colleges and universities) and staff will be available to discuss and demonstrate the projects: On Call, Energy Drive and Nanoswarm. Please click here to register. Thank you. Light snacks and refreshments will be available. MassDiGI’s Summer Innovation Program (SIP) begins on May 23 and runs through August 11. The program brings together 18 students from 9 different colleges and universities to work on sponsored game development projects under the guidance of professionals. SIP takes place on the campus of Becker College in Worcester. Students in SIP applied in early 2012. Of the 55 competitive applications from 22 institutions of higher education only 18 were selected. Sign up today! Please visit www.massdigi.org/gamechallenge for more information. MassDiGI will be at PAX East! Visit us at Becker College’s Booth #140 along with Muzzy Lane Software. Click here for more information about PAX East. We all know that the digital gaming cluster in Massachusetts is strong and getting stronger. 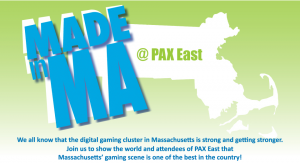 Join the Commonwealth of Massachusetts, MassDiGI, Boston Indies, MassTLC, MIT Enterprise Forum NE Games SIG and Boston Post Mortem to show the world and attendees of PAX East that Massachusetts’ gaming scene is one of the best in the country! Join us for an afternoon at Hampshire College discussing digital games, economic development, education and entrepreneurship.